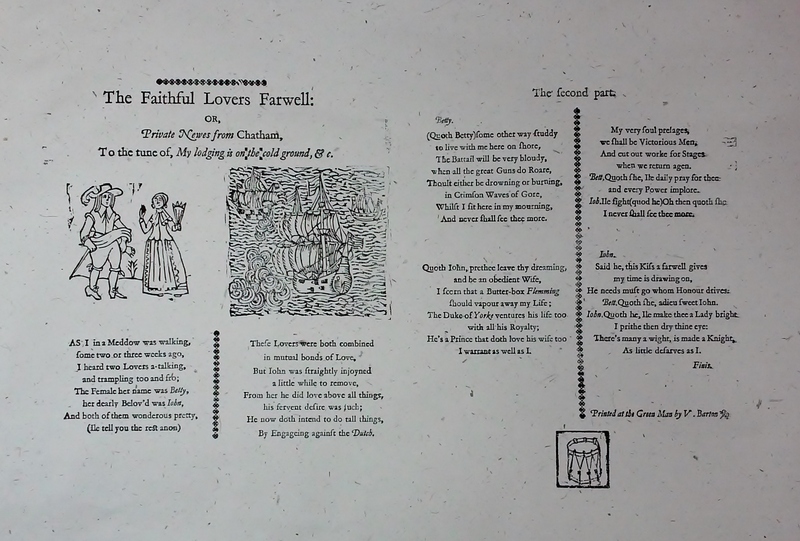 The woodcut created for the 1660s ballad. We were at Upnor Castle in Kent this weekend just gone, marking the 350th anniversary of the Medway raid. 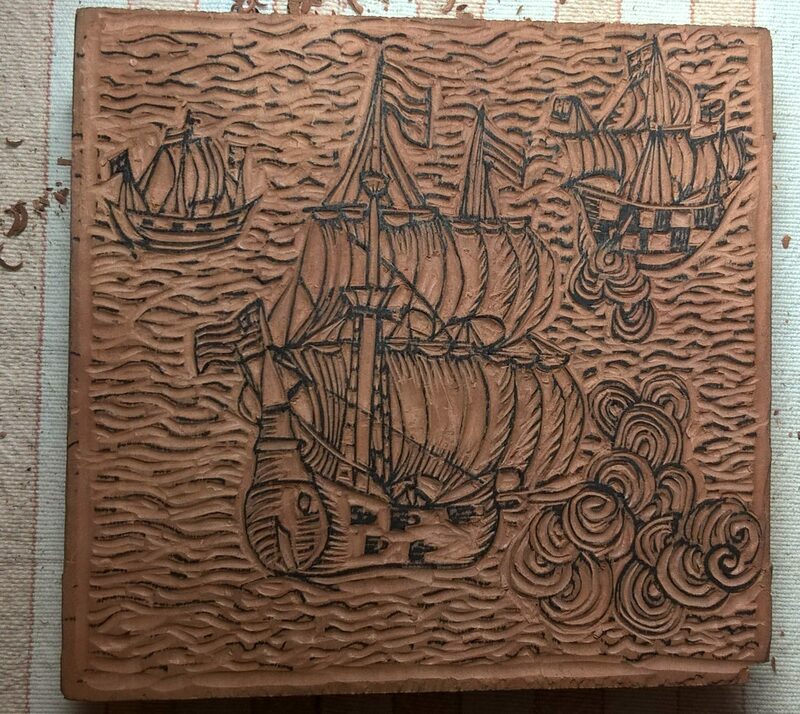 This event, a serious defeat and humbling of the English navy, is little known in England, but somewhat better recorded by the victorious Dutch. Led by Admiral de Ruyter, they sailed up the Medway river and attacked the English fleet that lay at anchor there. The tiniest workshop…and watch out for gunfire! Upnor is a tiny village looking across the river to Chatham and the Tudor castle was no longer used as a fort after this incident, instead being used as a gunpowder store. 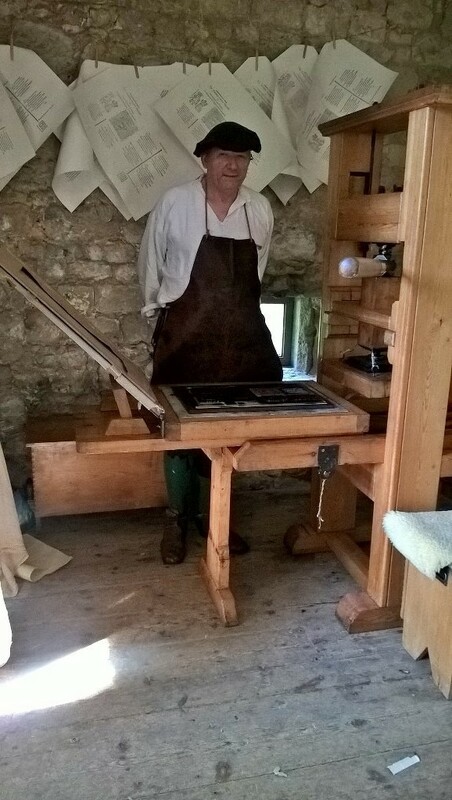 Access was rather challenging, but we got the press into the gatehouse and printed our 1660s style ballad from this location – we had to stop though, when the battle re enactment took place each afternoon. I was very happy with the result of the printing. The ballad is a condensed version of a contemporary one. We will be taking the forme on to the next re-enacted event of these celebrations, at Landguard Fort in Felixstowe, where an attempted Dutch invasion about 2 weeks later was repelled by the first Marines. That will be on 24th-25th June, and we look forward once again to welcoming Dutch re-enactors to share the event. Meanwhile, celebrations in the Medway towns continue with a big event called “Medway in Flames” coming up next weekend, 17th June 2017.